First things first: I've pulled all my make up from by bathroom and piled it into my wicker basket. 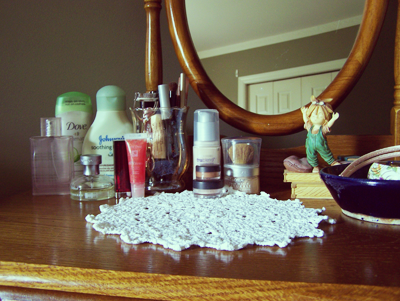 My most used make up goes into a pretty little blush, glass candle holder. Dad wasn't so excited I took it for make up, but its lovely and work perfectly. So he has to deal. Now since I can't see anything in my basket (really, there was SO much more in there than I thought there was!) I pulled everything out. Yeah...I think I really needed to do this. I did move all cleaners or lotions or nail polishes out of the way. 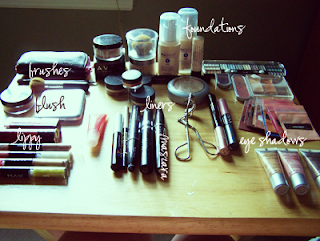 I'm dealing with make up and only make up this time. After seeing it all tossed about on my little table, I couldn't deal with it any more. I started pitching the old eye shadows, my mascaras I know are older than a year, and any foundations that aren't my skin tone or won't be during summer. And it already looked so much better. I then got crazy organized and put like items together. And doesn't it look amazing!? As you can tell, I have a theme with colors. I go for pinks and plums, golds and smoky blacks and browns. You'd think with those colors I'd like to wear them more! My worst but favorite purchase? TWILIGHT LIP VENOM. Oh-em-gee is that stuff awful AND it stains your lips for days, but I love it. I love how horrible it is. I've never worn it out and probably never will, but I'll save it for Halloween! 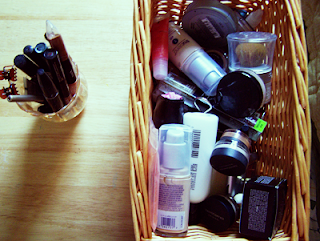 The last step was to move my newly organized make up to my vanity. I did basically stick with my same group of choices from before, but now when I put the rest away I am still able to see exactly what I have. 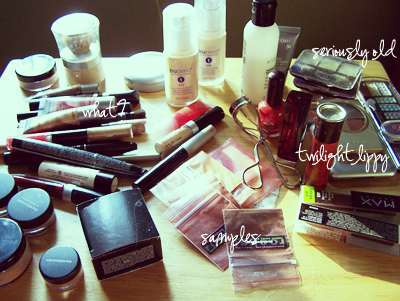 Now they look pretty and organized and now I really hope that tomorrow morning, I'll totally be wearing a little make up. Are you ready for #REbe? OOTD - Oh no I didn't buy these crazy shoes!